Creating Passionate Users is one of my favorite blogs and very happy to see this post after a long time (since those blog threats). I love to see this blog with those vivid pictures that convey the pragmatism and real wisdom that could otherwise takes 1000s of words and yet unclear. The revolutionary way of teaching concepts(HeadFirst Series) is beyond any comparison to any other book I have ever read. I love to see her back on the blog and with new books. It is very difficult to say any visualization as my favorite, as I love almost all her graphs and pictures. Just linked two of them, that are quite relevant to a discussion that I am bringing up in my next post. While it is tough to beat an argument on table that a team of people bring a lot to the table and consensus always brings better results, in reality it is quite the opposite in almost all ocassions. 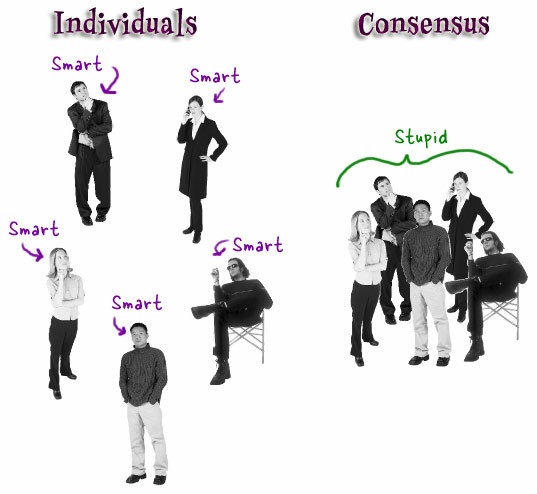 Consensus is something everybody is comfortable with, not necessarily better or the best. More over, argument of consensus assumes that everyone in the team has the same goal of achieving the best possible outcome, while in reality, it is totally just an assumption and something there will never be a consensus on. While many of us talk about 'empowering' , we always tend to and love to 'control' the entire environment to our whims and wishes. There are very few people I have seen or met, that really bring the best in others by giving them an autonomy and by respecting individual talents. Talent is normally not a key factor in environments where 'control' favors. Its always the level of 'sub-servience' that matters. People often confuse 'difference of opinion' with 'disloyalty' and any reasoning for a fair act as 'challenging' and 'disrespecting' their authority. 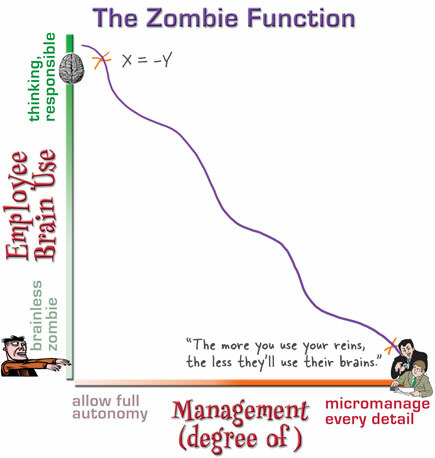 What these 'control' freaks never realize is that the other person becomes a zombie over time. Its always such an inspiring and mind-blowing simplicity in conveying a message, that I admire a lot in the blog and her books and I love to see it back in full throttle.